Under the theme, “Then and Now: Re-imagining Africa’s Future”, the 25th World Economic Forum (WEF) on Africa is convening African and global leaders from government, business and civil society to take stock of progress over the last 25 years, share insights on the present landscape and identify innovative approaches to accelerate inclusive growth while bringing about sustainable development in the future. President Jacob Zuma is leading a high-powered government delegation to the WEF on Africa meeting in Cape Town from 3 to 5 June 2015. The President is accompanied by 12 ministers and a deputy minister, five premiers and five mayors of metropolitan municipalities as well as several business leaders to showcase South Africa and explore opportunities at the meeting. The participants include vice-presidents, prime ministers, former heads of state and government, ministers as well as chairpersons of global companies. South Africa is using the WEF to showcase the country’s attractiveness as a business destination and that of the African continent in general. The President and his delegation are engaging business leaders in various sessions to share the competitive advantages and respond to questions raised. South Africa is marketing the country within the context of the National Development Plan. President Zuma’s participation in the summit is indicative of the high importance that the President and the South African Government place on developments in Burundi. 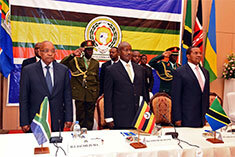 President Jacob Zuma, accompanied by the Minister of International Relations and Cooperation, Maite Nkoana-Mashabane, participated in the East African Community (EAC) Heads of State Summit on 31 May 2015 in Dar es Salaam, Tanzania. The summit discussed the political and security situation in Burundi. The President of the United Republic of Tanzania and current Chair of the EAC, President Jakaya Kikwete, extended an invitation to President Zuma to participate in the summit as special guest, in recognition of the pivotal role President Zuma had played in the negotiations that succeeded in bringing peace and stability to Burundi following the civil war in that country. Deputy President Cyril Ramaphosa represented President Zuma at the EAC Summit in Dar es Salaam on 13 May 2015. On 28 May 2015, President Jacob Zuma undertook a Working Visit to the Federal Republic of Nigeria to attend the inauguration of the President-Elect, General Muhammadu Buhari, on 29 May 2015 in Abuja. In his congratulatory message, President Zuma expressed his commitment to working closely with President Buhari to enhance the good bilateral relations which exist between South Africa and Nigeria, paying particular focus on the strengthening of economic cooperation. President Zuma also congratulated the people of Nigeria for conducting a peaceful, transparent, credible, free and fair election as declared by the Independent National Election Commission of Nigeria. The Working Visit to Nigeria presented an ideal opportunity for President Zuma to further strengthen and consolidate historic and strategic relations between the two countries, and to discuss regional and international issues of mutual concern. 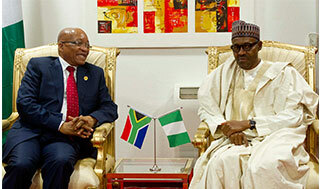 South Africa and Nigeria have enjoyed warm and cordial relations since the establishment of diplomatic relations in 1994, which culminated in the creation of the Bi-National Commission in 1999. The two countries have already signed 34 bilateral agreements and cooperation continues to grow. Total trade between South Africa and Nigeria increased from R15 billion in 2009 to R42 billion in 2013. The South African exports to and imports from Nigeria from January to December 2014 stood at R10,5 billion and R55,7 billion, respectively. Nigeria enjoys a surplus trade balance with South Africa, which is attributable to huge quantities of oil imports from Nigeria. South Africa exports vehicles, aircrafts and vessels, iron and steel products, machinery, equipment, plastics and rubber. 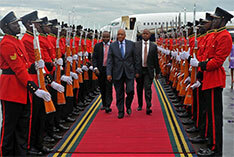 President Zuma was accompanied by Maite Nkoana-Mashabane, Minister of International Relations and Cooperation. 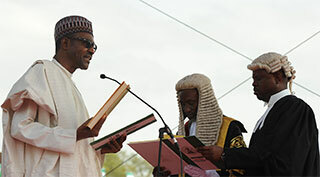 President-Elect, General Muhammadu Buhari, was sworn in as the President of Nigeria following his victory during the presidential election held on 28 March 2015. The Presidency said the Deputy President visited the countries in his capacity as Special Envoy of President Jacob Zuma to South Sudan. Deputy President Cyril Ramaphosa recently paid a Working Visit to Nairobi, Kenya, and later Juba, South Sudan, to meet with the presidents of the two countries. During his visit to Kenya, Deputy President Ramaphosa met with President Uhuru Kenyatta, and attended Kenya's National Day celebrations before consulting with Sudanese People’s Liberation Movement’s (SPLM) former detainees. On 1 June, Deputy President Ramaphosa proceeded to Juba, South Sudan, where he held meetings with President Salva Kirr and members of the SPLM Politburo. The Presidency said the visit to Kenya and South Sudan came against the background of efforts aimed at cementing lasting peace in South Sudan, building upon the Reunification Agreement signed in Arusha, Tanzania, early this year. The Adopt-a-School Foundation, of which Deputy President Ramaphosa is the founder and chairperson, mobilises companies and individuals to adopt deserving schools in South Africa. Deputy President Cyril Ramaphosa paid a Working Visit to London, United Kingdom, from 28 to 29 May 2015. 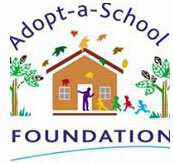 During the visit, Deputy President Ramaphosa hosted a fundraising dinner in aid of the Adopt-a-School Foundation. Deputy Minister Mfeketo’s engagement with the Sri Lankan Tamil Diaspora organisations followed her earlier visit to Sri Lanka, where she led an advance and technical team of experts to the country in February 2015. The Deputy Minister of International Relations and Cooperation, Nomaindiya Mfeketo, held a series of meetings with representatives of international Tamil Diaspora organisations from Sri Lanka, on 25 May 2015 in London, United Kingdom. South Africa’s engagement in Sri Lanka stems from the request by former Sri Lankan President, Mahinda Rajapaksa, to President Jacob Zuma during the 23rd Commonwealth Heads of Government Meeting in Colombo in November 2013 and a subsequent invitation from Prime Minister Ranil Wickremesinghe for South Africa to engage through its Special Envoy and share its experiences in political dialogue, negotiations, reconciliation and nation-building. The same sentiments were also relayed to President Zuma by the leadership of the Tamil National Alliance. In his State of the Nation Address in February 2014, President Zuma announced the appointment of the Deputy President, Cyril Ramaphosa as his Special Envoy for Sri Lanka. One of the cornerstones of the South African initiative in Sri Lanka is to consult with stakeholders within and external to Sri Lanka as part of South Africa’s initiatives aimed at promoting a lasting political solution, peace initiatives, truth-telling and reconciliation in Sri Lanka. 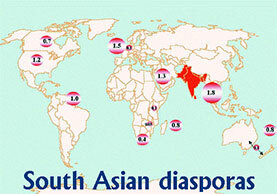 This includes some members of the Sri Lankan Tamil Diaspora. South African government leaders have also engaged South Africa-based Tamil civil-society groups through Deputy Minister Mfeketo. The students will be travelling to Sweden to commence their studies in August 2015. These young students from across South Africa will pursue their Masters' studies in a wide range of fields, including Environmental Studies, Computer Sciences, Engineering, Education, Organisational Psychology and Development Studies. 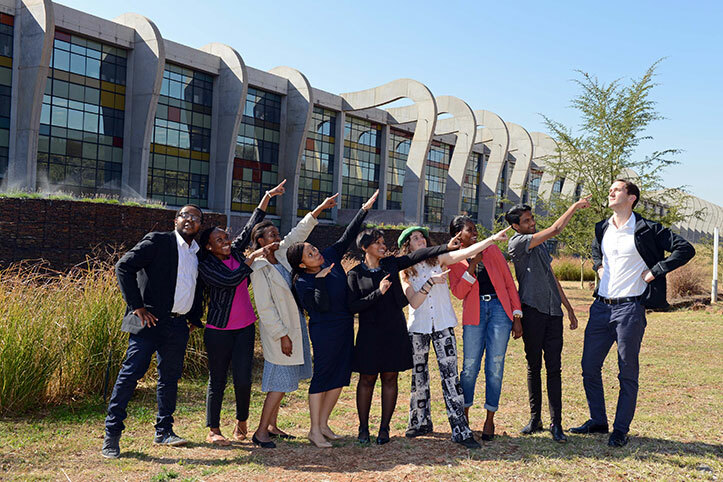 On 29 May 2915, the Department of International Relations and Cooperation (DIRCO) hosted South African students who were selected for a Swedish postgraduate scholarship programme at OR Tambo Building, Pretoria. This programme, at the initiative of DIRCO, offers 10 scholarships per annum over a period of three years and will be funded by the Swedish Institute. This is in recognition of the centrality of education and skills development for the economic prosperity of both countries.The first round of successful applicants commenced their studies in August 2014, and are currently in Sweden pursuing their fields of interest. The scholarship programme was agreed to at the Eighth Session of the South Africa-Sweden Bi-National Commission (BNC), which took place on 11 October 2013 in Pretoria. The BNC is co-chaired by South Africa’s Deputy President and Sweden’s Deputy Prime Minister and takes place on a biennial basis. Bilateral relations between South Africa and Sweden are excellent and have a strong historical basis with Sweden supporting South Africa’s struggle for freedom and democracy. Present-day relations cover a wide variety of areas. The ceremony took place at Gallagher Estate, with Home Affairs Minister Malusi Gigaba opening his speech with "Africa must unite!" a phrase associated with Kwame Nkrumah, the first President of independent Ghana. On 25 May 2015, the Department of Home Affairs hosted the Mkhaya Migrant Awards. The annual awards are meant to "honour and recognise migrants contributing to South Africa’s development as well as South Africans contributing to the development of Africa in their various fields of expertise”. The awards consist of six categories, including sport; arts and culture; business; civil society; the “Most Integrated Community”, which went to the Makana community near Grahamstown; and the OR Tambo Award. Zimbabwean founder of Vanguard Magazine, Panashe Chigumadzi, who was not present to receive her award, was the winner of the Arts and Culture Category. Sephaku Cement from Nigeria won the award in the Business Category which "celebrates business people whose businesses are in line with the Reconstruction and Development Programme". Patricia Modiaya, founder of KWESU, which “is a small but growing organisation, expanding its footprint to assist fellow migrant women in need”, won the Civil-Society Award. Nigerian national, William Okpara, a former Orlando Pirates goalkeeper who also represented his home country, won the Sports Award. The OR Tambo Award had three notable nominees: Kabelo Mphahlele, Patrick Maphoso and Gift of the Givers, with Mphahlele walking away as the winner of this category. Keynote speaker, Nkosazana Dlamini Zuma, African Union Commission Chairperson, spoke at length on African unity and touched on the issue of xenophobia, crediting the South African Government and President Jacob Zuma with taking the leadership role in tackling the crisis. 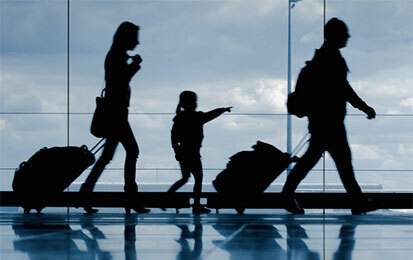 From 1 June, if a person is travelling with a child – whether single, married or divorced – they must have a passport as well as an unabridged certificate which reflects the details of the parent when entering or leaving South Africa. As of 1 June 2015, all minors travelling to and from the Republic of South Africa will be required to produce an “unabridged birth certificate”, Home Affairs Director-General (DG), Mkuseli Apleni, said recently. He said the new requirements were aimed at establishing the principle that all minors required the consent of their parents when travelling in and out of the country to address, among others, security concerns. An unabridged birth certificate is a certificate that contains the details of both the child’s parent, including their marital status and whether they are the biological parents as well. The DG said in the case of a single parent, where the second parent did not acknowledge paternity, such consent would not be required from the second parent, meaning that his or her details can be left out of the unabridged certificate. He said in the event where the custody of the child was shared, consent must be sought from both parents for the purposes of travelling with the minor. In the event of a divorce, both parents be given a joint custody, an unabridged certificate with the details of both parents is required. Where an adult is not a biological parent of the child, the person needs to produce a copy of an unabridged certificate and an affidavit saying he or she has permission to travel with the child. He said to create awareness about the new regulations to parents who did not understand the regulations, an advisory would be posted on the Home Affairs website, and a pamphlet would be produced explaining the requirements clearly. The DG said the regulations were not a burden to parents, and that they were introduced to protect their children. Other countries like the United States, the United Kingdom, Australia and other European countries had the same requirements, he explained. Ambassador of South Africa to Peru, Elsa Dry, said the focus on the three sectors was meant to increase bilateral trade and investment between the two countries. Mining, agroprocessing and construction will be the focus of the newly-established South Africa-Peru Chamber of Commerce (SAPCHAM), said the Department of Trade and Industry (dti). Speaking at the launch of the chamber, which took place in Lima, Peru, recently, Ambassador Dry said the two countries had considerable strength in these sectors. “Both the Embassy, in cooperation with the dti and the new chamber have decided to focus on three sectors, namely mining, agroprocessing and construction. Both our countries have considerable strengths in these sectors. As developing countries, we can also learn a great deal from, and complement each other,” said Ambassador Dry. The launch of the chamber was attended by a business delegation, which was in Lima on a week-long Outward Trade and Investment Mission, as well as South African businesspeople doing business in Peru. Ambassador Dry also identified the export of capital equipment to Peru mostly for mining by South Africa and Peru’s export of agricultural products such as asparagus, giant squid and avocados to South Aafrica as some of the complementaries that the two countries could focus on and grow their bilateral trade. “Furthermore, South Africa has great expertise in the wine industry, which Peru may wish to discover and tap into. Another area which could be interesting to focus on in future is the Blue Economy which comprises our marine and river resources, aquaculture and offshore drilling,” she said. Amb Dry explained that the launch of the chamber was part of the initiatives that South Africa had taken to improve the bilateral economic relations between the two countries. This included the scoping mission that was undertaken by the dti in 2013, followed by the first trade and investment mission to Peru last year. The South African Embassy in Peru also hosted culinary weeks which sought to promote South African food and wines in Peru. The inaugural president of the chamber, Guillermo van Oordt, said the chamber would contribute significantly in increasing trade and investment between South Africa and Peru. “The objectives of the chamber include to actively promote the interests of businesspeople from Peru and South Africa, organise regular meetings for networking, facilitate constant contact between companies of the two countries and organise bilateral trade missions,” he said. The South African National Defence Force (SANDF) Wall of Remembrance Memorial Service was inaugurated on 25 October 2009. Consensus was reached that the service would become an annual event and that it would take place on the Sunday nearest to 31 May. On 31 May 2015, the Freedom Park, in conjunction with the Voortrekker Monument Heritage Site, hosted an annual memorial service to commemorate members of the SANDF who passed away serving the country. There were about 2 489 names at the Wall of Remembrance. A further 27 names were added recently of members who had passed on under the qualifying circumstances between the years 1961 to 1994. The commemoration came at a time when Africa was commemorating Africa Month, which called for unity, reconciliation and peace. “It is therefore befitting that this gesture of unity and reconciliation is commemorated at this memorable month. Forgiveness is a sign of strength not weakness; this memorial service ceremony demonstrates character and strengths on the part of former sworn enemies,” said Freedom Park acting CEO, Jane Mufamadi. A new technique developed by doctors at Tygerberg Hospital is now challenging the prognosis for serious burn victims, offering life-saving, viable and affordable treatment and making their previously bleak outlook much brighter. A new technique developed at Tygerberg Hospital could transform the way burns are treated, cutting the cost a thousand-fold in the process. Dr Wayne Kleintjies, head of the Adult Burn Unit at Tygerberg Hospital developed the new technique, which makes use of the patient’s own skin, which is then externally cultivated in a laboratory from skin harvested via a skin biopsy. Other options, using skin from donors or other species are soon rejected and have proven to be of limited value. The new technique is remarkable in the sense that it offer patients treatment at the fraction of the cost that similar techniques would normally cost. "With our new technique, we treated the first patient with a total cost of R995," Dr Kleintjies said. The technique is not entirely new, but the culture method differs dramatically from others in its simplicity, effectiveness, biological safety and modest cost. The technique costs around R1 000 whereas comparable treatment with existing methods could stretch to R1 800 000. A great advantage is that no immunosuppressant drugs are needed because the patient’s own skin is used. Dr Kleintjies explained that the technique was revolutionary due to the fact that no expensive and extensive laboratory equipment was needed. "We can now grow skin in the room next to the patient", Kleintjies said. "The simplicity of the technique, the cost-effectiveness and the effectiveness is comparable to other skin culture techniques and also important is the fact that it is absolutely biologically safe." During the press conference, Dr Kleintjies said that burns covering more than 30% of the total body area were life-threatening in most cases. "Patients will certainly benefit from this new technique." This new technique, referred to by Kleintjies as the "Tygerberg Burns Unit Technique", has been successfully used in the past year on two patients. A 16-year-old boy was discharged from the ICU only two weeks after receiving the transplant and the second patient, who had 63% total body surface area burns, was out of the ICU in four weeks. The World Forestry Congress (WFC) is the largest and most significant gathering of the world's forestry sector and is held every six years since 1926. The Department of Agriculture, Forestry and Fisheries will launch the XIV WFC in partnership with the Food and Agriculture Organisation of the United Nations and other government departments. South Africa is geared and ready to host this global event, the first of its kind to be held on African soil. The congress will be held from 7 to 11 September at the Albert Luthuli Durban International Convention Centre, under the theme “Forest and People: Investing in a Sustainable Future”. It is a forum for sharing of knowledge and experience regarding the conservation, management and use of the world's forests. Furthermore, it will provide a platform for deliberating critical issues facing the forestry sector such as the role of food security in forestry, one of the department’s priority areas. Johannesburg (number 55) and Cape Town (number 69) saw their ranks improve the most in the Global Cities Index (GCI). Johannesburg and Cape Town are showing improvement in the spheres of political engagement and human capital respectively, according to a global report. Partner at AT Kearney Johannesburg, Wim Plaizier, told Fin24 that the growth of political engagement in Johannesburg was being driven by the growth in the number of consular and other diplomatic representation, NGOs and think-tanks in the city. Plaizier said African cities were making significant advances. “The fact that Cape Town, for example – which did not make the list last year – has come in at number 69 is very encouraging, and indicates that the emerging cities are making positive gains,” he said. “This information is important for those making investment decisions,” he said. According Harald Harvey, also a partner at AT Kearney Johannesburg, “the development of human capital in Cape Town is being driven by the growth in tertiary and secondary education”. Harvey also highlighted the increase in the number of people moving to Cape Town, reflecting its attractiveness as a location with high living standards. The destination moved up by 11 rankings in terms of worldwide performance to number 41. Cape Town has retained its position as the number one destination for business events in Africa, according to the latest International Congress and Convention Association Country and City rankings. Cape Town hosted 58 international association meetings, up 13 from the previous year. Johannesburg is in second position in Africa, followed by Marrakech (Morrocco) in third and Durban in fourth spot. Tim Harris, CEO of Cape Town and the Western Cape’s official tourism, trade and investment promotion agency Wesgro – of which the Cape Town and Western Cape Convention Bureau is a strategic business unit – said the business events environment was extremely competitive, so it was a considerable achievement to retain the number one spot. "Cape Town has remained on top because of our collaborative approach, our excellent service offering and our levels of professionalism. The Cape Town city region has global appeal, and our world-class infrastructure – including the award-winning international convention centre and airport – combine to make us the first choice conferencing destination in Africa,” said Harris. To further enhance the rankings in the Western Cape, Stellenbosch bettered its 2013 results, moving up five spots to seventh position in South Africa. South Africa – with 124 meetings – maintained its number one spot in Africa in the country rankings, moving up two rankings worldwide to number 32. In an historic first for South Africa, the destination has bagged three global awards at the world’s biggest business event trade show, Imex 2015. More than 14 700 delegates from 150 destinations attended the trade fair in Frankfurt. Anzelle Vorstman, a tourism and hospitality student at North West University, won first place in the Imex-MPI-MCI Future Leaders Forum International University Challenge. Joburg Tourism won the Destination Marketing Humanitarian Award that recognises the destination marketing organisation which best demonstrates leadership and community support. 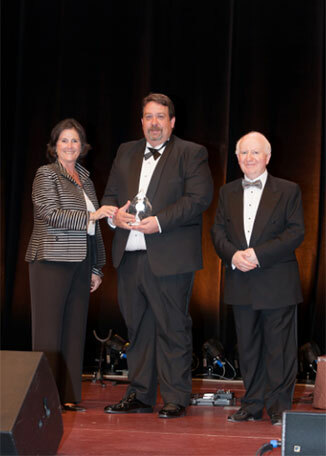 Pieter Swart Conference Consultancy South Africa won the PCMA Global Meetings Executive of the Year Award. “The awards send a strong message to the global business events market that South Africa is home to people and organisations that are business events pioneers, and that hold significant intellectual capacity and practical know-how in the profession. “These figures are pleasing not just for SANParks but for the country in general: evidence that our abundant wildlife continues to attract our citizens and foreign visitors, and in particular, more visitors from the continent” says SANParks CEO Fundisile Mketeni. The number of visitors to one of the country’s most popular holiday destinations continues to increase. Locals and international visitors, including higher numbers from the Southern African Development Community (SADC) region, are visiting the Kruger National Park (KNP) managed and operated by SANParks. 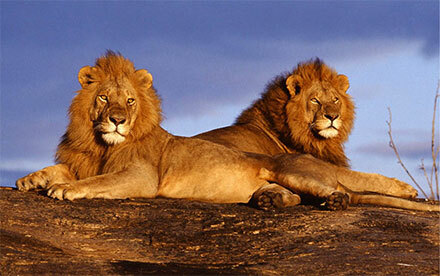 The park, home of the legendary Big Five, is attracting more day visitors in particular. A total number of 1 659 793 guests passed through the gates of the KNP in the 2014/15 financial year, compared to 1 556 916 the previous financial year, SANParks and the Department of Environmental Affairs said on recently. Of this number, 1 277 397 were day visitors and 382 396 were overnight guests. Between the 2012/13 and 2014/15 financial years, the number of day visitors entering the KNP grew by an additional 239 817. Day visitor volumes picked up noticeably in December, with 148 138 day visitors entering the park. A total of 382, 396 overnight guests spent a night or more inside the national park, generating R321 482 million in accommodation fees for SANParks. 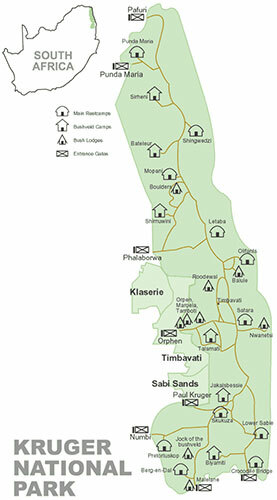 Of the 25 SANParks-operated camping facilities inside the KNP, the majority overnighted at the popular Skukuza camp. Minister of Environmental Affairs, Edna Molewa, congratulated SANParks. “Since the proclamation of the Kruger nearly a century ago, it has continued to be a local and international draw-card for tourists, and this is largely because of sterling management by SANParks,” said Minister Molewa. 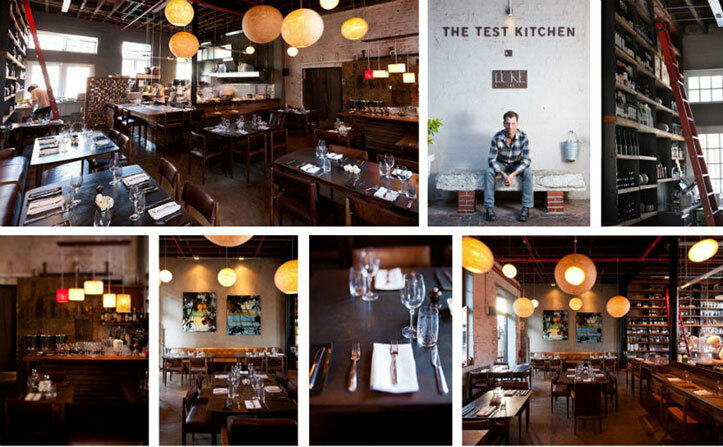 The World's 50 Best Restaurants were announced in London recently and Cape Town restaurant, The Test Kitchen, has come in at number 28, a whopping 20 places up from last year. It is also the Number One restaurant in Africa. Last week, for the first time in the competition's history, the 51-100 Best Restaurants were announced. Franschhoek restaurant, The Tasting Room, at Le Quartier Francais was named the 88th best restaurant in the world. The South Africans are among the firm favourites in the tournament after coming so close to beating England in a pulsating final last June in Auckland, New Zealand. A motivated Junior Springbok squad is competing in the World Rugby Under-20 Championship in Italy. The set off for this year's instalment of the tough under-20 championship buoyed by a good 2-0 away series victory over Argentina. A fit and well-conditioned squad of 28 players, they will attempt to become only the second South African team to lift the U20 championship crown, and follow in the footsteps of the triumphant side of 2012. Apart from the trials, the squad's training camp of six weeks included two training matches against the Western Province Rugby Institute, a thrilling successful clash against a star-studded Varsity Cup Dream Team plus an away series against the formidable Los Pumitas. Coach Dawie Theron said the squad was excited and looking forward to getting to Italy after the long and intensive training camp. "The boys are rearing to go and we have a great team spirit," said Theron. "They are in a very good conditioning shape and I am pleased with the amount of work we have done at our training base in Stellenbosch." 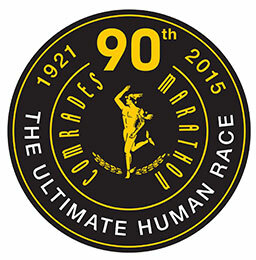 The 90th Comrades Marathon, held on 31 May, belonged to South Africa. Caroline Wostmann became the first South African female winner since Rae Bisschoff in 1998. Wostmann was also less than three minutes off the up-run record held by Russian veteran Elena Nugralieva. 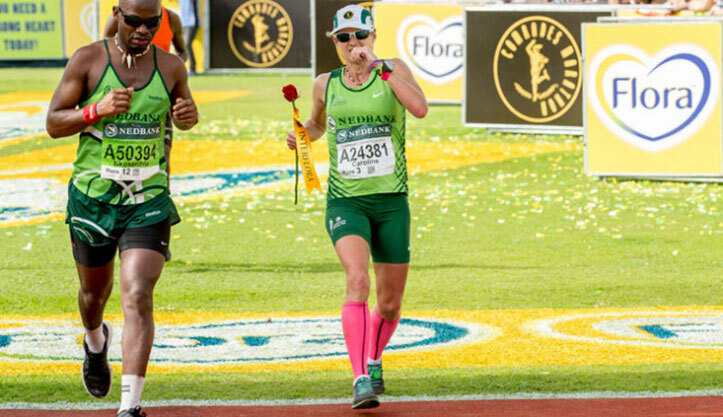 Wostmann is also the first South African woman to win the Two Oceans Marathon and Comrades in the same year. 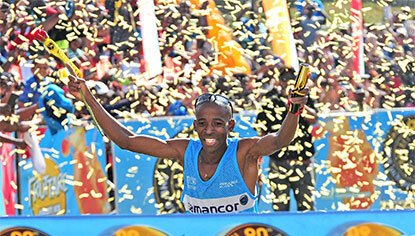 Only some 35 minutes earlier, Gift Kelehe had won gold in the men’s race, which meant that South Africa had a male and female winner for the first time since 1992. Kelehe’s older brother, Andrew Kelehe, won the race in 2001. The Rustenburg-based policeman may have had a tough time preparing for the race with work hours providing a major obstacle to his training, but he was never short of confidence. And that confidence remained after the race.